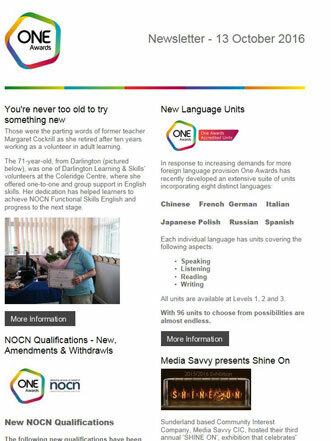 One Awards e-newsletter is circulated to all our recognised centres, we welcome your comments or ideas about what you would like to be included. We would also love to see hear about what is happening in your organisation? Introduction or overview of your organisation - as we work with organisations from all sectors it would be interesting to find out how learning fits into what you do. Please send us your information along with images and we will include it in the newsletter, website news page and twitter feed.